The list is subject to change depending on solar flares and stuff, but here's one version of it. I've spent the last week with the Super NES Classic. You can read about it here. 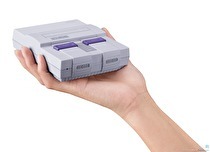 The little SNES is adorable and filled with merriment and fun. Additionally, it's filled with 21 different games spanning the life of Nintendo's second home console. As of the days before the Super NES Classic is available to all, here's my personal ranking of all 21 games, as they are presented on the Super NES Classic. After finishing Samus' latest journey, Neal ponders where it might fit in the 2D Metroid hierarchy.